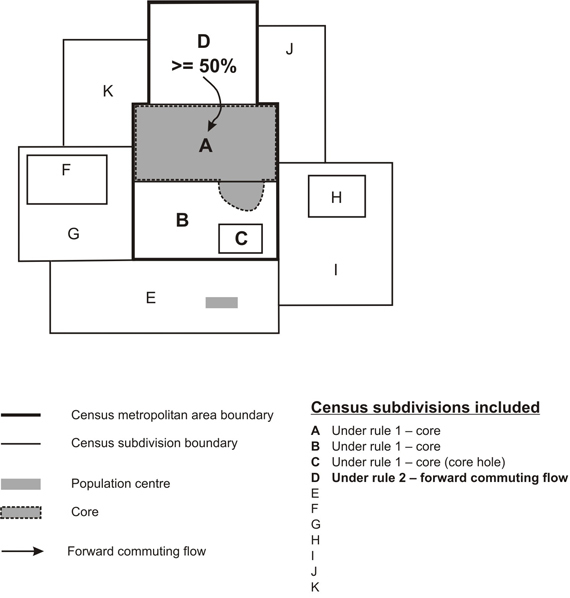 A census metropolitan area (CMA) or a census agglomeration (CA) is formed by one or more adjacent municipalities centred on a population centre (known as the core). A CMA must have a total population of at least 100,000 of which 50,000 or more must live in the core. A CA must have a core population of at least 10,000. To be included in the CMA or CA, other adjacent municipalities must have a high degree of integration with the core, as measured by commuting flows derived from previous census place of work data. If the population of the core of a CA declines below 10,000, the CA is retired. However, once an area becomes a CMA, it is retained as a CMA even if its total population declines below 100,000 or the population of its core falls below 50,000. Small population centres with a population count of less than 10,000 are called fringe. All areas inside the CMA or CA that are not population centres are rural areas. When a CA has a core of at least 50,000, it is subdivided into census tracts. Census tracts are maintained for the CA even if the population of the core subsequently falls below 50,000. All CMAs are subdivided into census tracts. 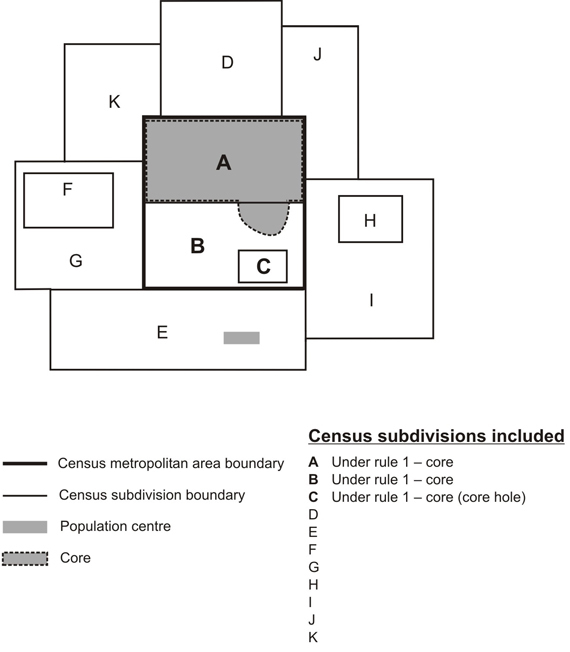 The terms 'core,' 'fringe' and 'rural area' replace the terms 'urban core,' 'urban fringe' and 'rural fringe' for the 2011 Census. A census metropolitan area (CMA) or a census agglomeration (CA) can have more than one core. The core of a CMA must have a population of at least 50,000 and the core of a CA must have a population of at least 10,000. In all other cases where a CMA or a CA has more than one core, the additional cores are called secondary cores. When a CA is merged with a CMA, the core of the former CA also becomes a secondary core of the CMA. If the population of a fringe population centre exceeds 10,000, it becomes a secondary core of the CMA or CA in which it exists. See Merging adjacent CMAs and CAs (delineation rule 7). 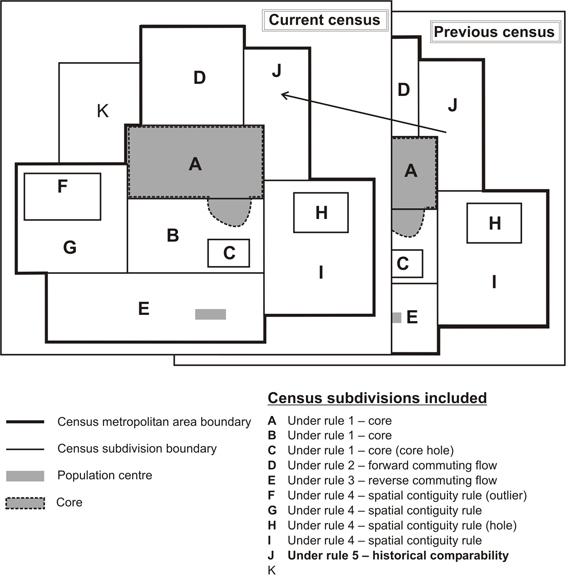 A CMA or CA is delineated using adjacent municipalities (census subdivisions) as building blocks. These census subdivisions (CSDs) are included in the CMA or CA if they meet at least one of the following rules. The rules are ranked in order of priority. A CSD obeying the rules for two or more CMAs or CAs is included in the one for which it has the highest ranked rule. If the CSD meets rules that have the same rank, the decision is based on the population or the number of commuters involved. A CMA or CA is delineated to ensure spatial contiguity. 1. Core rule: The CSD falls completely or partly inside the core. A core hole is a CSD enclosed by a CSD that is at least partly within the core and must be included to maintain spatial contiguity. In Figure 6, CSDs A, B and C are included in the CMA or CA because of the core rule. CSD C is a core hole. 2. Forward commuting flow rule: Given a minimum of 100 commuters, at least 50% of the employed labour force living in the CSD works in the delineation core (see following note), as determined from commuting data based on the place of work question in the previous census. Note: For CMA and CA delineation purposes, a delineation core is created respecting CSD limits. For a CSD to be included in the primary or the secondary delineation core, at least 75% of a CSD's population must reside within the core. In Figure 7, CSD A is part of the delineation core since its entire population resides within the core. CSD B would also be part of the delineation core if at least 75% of its population resides within the core. For this example, we have assumed that less than 75% of the population of CSD B resides within the core; therefore, CSD B and its enclosed hole, CSD C, are not considered to be part of the delineation core. 3. 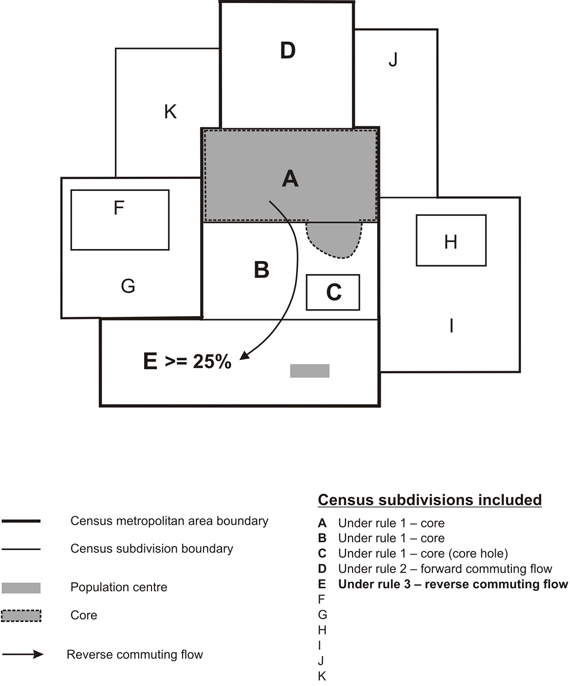 Reverse commuting flow rule: Given a minimum of 100 commuters, at least 25% of the employed labour force working in the CSD lives in the delineation core as determined from commuting data based on the place of work question in the previous census. In Figure 8, at least 25% of the employed labour force working in CSD E lives in CSD A (see Note for rule 2). 4. Spatial contiguity rule: CSDs that do not meet a commuting flow threshold may be included in a CMA or CA, and CSDs that do meet a commuting flow threshold may be excluded from a CMA or CA. Outlier — A CSD (F in Figure 9) with sufficient commuting flows (either forward or reverse) is enclosed by a CSD (G in Figure 9) with insufficient commuting flows, but which is adjacent to the CMA or CA. When this situation arises, the CSDs within and including the enclosing CSD are grouped to create a minimum CSD set (F + G). The total commuting flows for the minimum CSD set are then considered for inclusion in the CMA or CA. If the minimum CSD set has sufficient commuting flows (either forward or reverse), then all of its CSDs are included in the CMA or CA. Hole — A CSD (H in Figure 9) with insufficient commuting flows (either forward or reverse) is enclosed by a CSD (I in Figure 9) with sufficient commuting flows, and which is adjacent to the CMA or CA. When this situation arises, the CSDs within and including the enclosing CSD are grouped to create a minimum CSD set (H + I). The total commuting flows for the minimum CSD set are then considered for inclusion in the CMA or CA. If the minimum CSD set has sufficient commuting flows (either forward or reverse), then all of its CSDs are included in the CMA or CA. 5. Historical comparability rule: To maintain historical comparability for CMAs and larger CAs (those with census tracts in the previous census), CSDs are retained in the CMA or CA even if their commuting flow percentages fall below the commuting flow thresholds (rules 2 and 3). See Figure 10. An exception to the historical comparability rule is made in cases where CSDs have undergone changes to their boundaries, such as annexations. To determine whether to keep or exclude a CSD, place of work data are retabulated for the CSD with boundary changes, and a decision to include or exclude the CSD is made according to the previous rules. 6. Manual adjustments: A CMA or CA represents an area that is economically and socially integrated. However, there are certain limitations to the extent by which this ideal can be met. Since the CSDs that are used as building blocks in CMA and CA delineation are administrative units, their boundaries are not always the most suitable with respect to CMA and CA delineation. There are always situations where the application of the above rules creates undesirable outcomes, or where the rules cannot be easily applied. In these circumstances, a manual override is sometimes applied to ensure that the integrity of the program is retained. For example, in Miramichi CA (New Brunswick), the CSD of Red Bank 4, IRI, which is in two parts, is included to maintain spatial contiguity. 7. Merging adjacentCMAs and CAs: A CA adjacent to a CMA can be merged with the CMA if the total percentage commuting interchange between the CA and CMA is equal to at least 35% of the employed labour force living in the CA, based on place of work data from the previous census. The total percentage commuting interchange is the sum of the commuting flow in both directions between the CMA and the CA as a percentage of the labour force living in the CA (i.e., resident employed labour force). If more than one CA is adjacent to the same CMA, each CA is assessed separately with the CMA. Several CAs may be merged with one CMA. If the total percentage commuting interchange is less than 35%, the CMA and CA are not merged. After a CA is merged with a CMA, the core of the former CA is called the secondary core of the CMA. See Figure 11. In order for a requested CMA name change to be implemented, there must be explicit consensus among all eligible component municipalities on a proposed new name and a formal request, in accordance with these guidelines, must be sent to the Director of the Geography Division at Statistics Canada by June 1 of the year prior to the census. The CMA name change will be implemented in the revision of the Standard Geographical Classification related to the census under consideration. Table 1 in the Introduction shows the number of census metropolitan areas and census agglomerations by province and territory. Two CMAs from the previous census had their names changed: Abbotsford became Abbotsford-Mission (B.C.) and Kitchener became Kitchener-Cambridge-Waterloo (Ont.). The CSD limits used in CMA and CA delineation are those in effect on January 1, 2011 (the geographic reference date for the 2011 Census) and received by Statistics Canada before March 1, 2011. In addition, CMA and CA delineation uses commuting data based on the place of work question asked in the previous census. 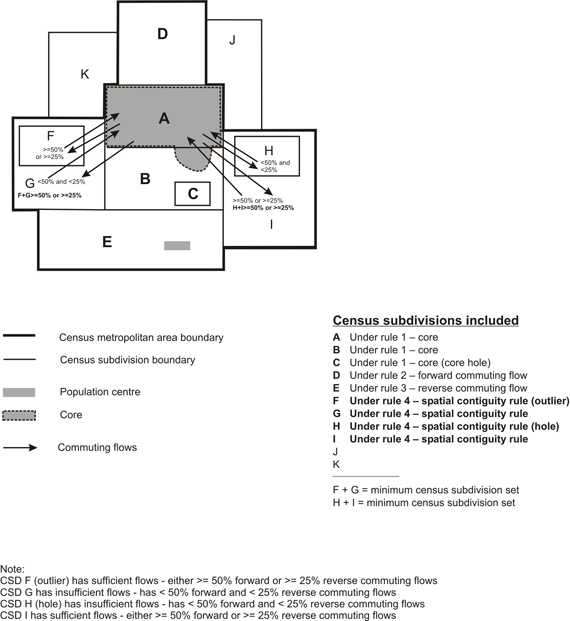 Refer to the related definitions of census subdivision (CSD); core, fringe and rural area; population centre (POPCTR) and to the geography working paper Preliminary 2011 Census Metropolitan Area and Census Agglomeration Delineation(Catalogue no. 92F0138MWE2009002). Six of 27 CMAs were affected significantly as a result of municipal restructuring: Halifax (N.S. ), Ottawa – Hull (Ont./Que. ), Kingston (Ont. ), Greater Sudbury (Ont. ), London (Ont.) and Windsor (Ont. ).